China is still executing thousands of prisoners per year but there are flickers of hope that attitudes there towards the death penalty are changing, the head of Amnesty International said. 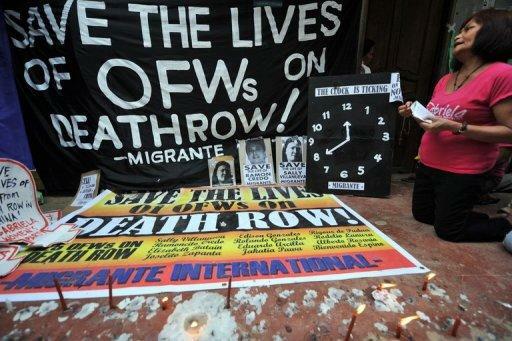 Salil Shetty, secretary general of the London-based human rights group, told AFP that the rise of blogging and social media in China had increased public pressure on its rulers over the use of capital punishment. The Chinese government scrapped the death penalty for 13 rarer white-collar offences last year but retains it for non-violent crimes such as drug trafficking and corruption. In its annual review of death sentences and executions published on Tuesday, Amnesty said China's use of the death penalty continued to be shrouded in secrecy, and accurate figures were impossible to obtain. "While still accounting for the majority of the world's executions, in 2011 the Chinese authorities continued to shroud the country's use of the death penalty in secrecy and impeded verification of their claims of a significant reduction in the use of capital punishment since 2007," the report said. Amnesty has stopped using death penalty figures from public sources in China, feeling they are likely to grossly underestimate the true number. 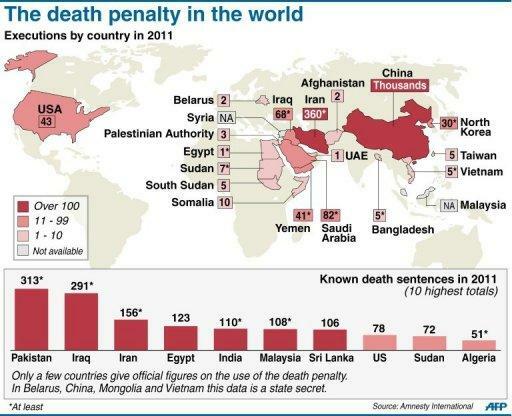 "Nothing quite compares to China in terms of numbers of executions," Shetty told AFP. "The main reason why this happens is that the death penalty is applicable for almost 55 crimes. "One of the interesting things in China which we are more optimistic about is that there have been some cases that have come into more public debate now." He cited the case of 30-year-old Wu Ying, once listed among China's richest women, who was convicted of illegal fundraising. Her death sentence is subject to review by China's Supreme People's Court, following a "public outcry", Shetty said. The Indian veteran activist said there was now "huge potential" for pressure to mount on the Chinese authorities via the rise of the Internet in China but warned that Beijing was alert to the threat. "The blogging phenomenon has really increased public discussion but they have also become very repressive with the bloggers. They've incarcerated so many people in the recent past," said Shetty. "There's been a real surge in curbing freedom of expression." The Amnesty chief also criticised the Chinese judicial process, saying that suspects "don't have fair trials to start with". "There is almost a 100 percent conviction rate. Once you get charged, you're pretty much convicted," he said. "There's no presumption of innocence. "Chinese trials are very open to political interference because most of these courts are under the supervision of the Communist Party." Shetty said that while there was plenty of "encouraging news" from Beijing, it was important not to forget that China remains by far the world's biggest state executioner. "It's a paradox of a situation," he said. "There is a bit of hope there but we're still a long way from where we would like to be."